Breathing fresh life into the classic Egyptian-themed video slot is the goal of many a developer with US giant WMS the latest to have a crack with Desert Cats. They’ve made a pretty good attempt too in this unusual 7 reel, 50 payline game. You’ll find 2 adjacent reels on each base game spin, a free spins round with wild reels and 5 potential jackpot prizes of up to 2,000 times your bet. Play on your PC, tablet or mobile from between 50p and £100 per spin. There are many positive things to say about WMS video slots but design isn’t usually one of them. Desert Cats is another functional rather than inspiring offering. On the reels you’ll see A to 10 symbols alongside ankh crosses, stone tablets and death masks. The best of the standard symbols is the woman. Land 3, 4, 5, 6 or 7 of these in the same payline and you’ll receive a payout of 5, 10, 20, 50 or 200 times your bet. Central to the action is the golden cat which is the wild. This can land as a standard 1×1 symbol or in a 2×2 block. On every base game spin, 2 adjacent reels will be made up entirely of wilds. These wilds pay the same as the top paying woman symbol. There are 2 extra on offer in Desert Cats. Free Spins Bonus feature – land 3, 4 or 5 of the lion scatter symbol and you’ll receive 5, 15 or 50 free spins (as well as a payout of 10 or 15 times your total bet if you land 4 or 5 scatters). The set up in the feature is slightly different. Rather than 2 adjacent wilds reels, you’ll see single wild reels throughout the free spins round. Landing 3 scatters on the same free spin adds another 5 free spins to your tally. 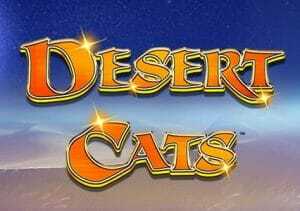 Desert Cats certainly isn’t the best looking Egyptian-themed video slot on the market. It’s colourful yes but the imagery doesn’t really dazzle. What does stand out is the unusual gameplay, especially the wild reels which really perk up the base game. We managed a payout of 200 times our stake from a single spin there. Add the free spins and the bumper 2,000 times bet jackpot and there’s some potentially serious action on offer here. We weren’t overly impressed by the design but the features make Desert Cats well worth a spin if you like all things ancient. If they had higher value symbols, Desert Cats could have become a real favourite. Anyway, I recommend Lady of Egypt (also by WMS) which has 10 reels!